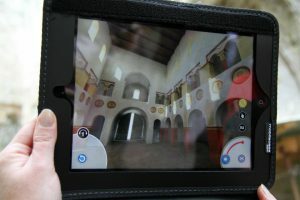 With Jumièges 3D our visitors have the opportunity to discover in situ the reconstitution of Jumièges Abbey just like it was before its destruction. With augmented and substituted reality techniques, it is now possible to superpose 360 degree virtual views in 3D with the view of the current vestiges. The effect is breathtaking; to have a walk back in time becomes really easy thanks to a very simple interface. Technically, the application can be downloaded on the App Store, for smartphones, and on Google Play for numerical pads. Some iPads are also available for rent at the reception desk of the abbey. After a general presentation, the screen will show a map allowing getting to several stops. In front of each stop, by orienting the pad or the smartphone towards the building, one will be able to lead the reconstitution of the monument at the designated period, inside a 360° immersive panoramic video. At each place, several numerical equipment (audio-commentaries with photo-album, videos…) will provide our visitors with some useful information to understand the premises and its history. Jumièges Abbey is a complex monument where each century left its mark. From its origins to the 18th Century, the very long history of the monastery is punctuated with some modernization and reconstruction works among which some are not visible at all now. So, our priority was to determine the best venues for this reconstitution, from the documents available and the subsisting vestiges. The choice of the four venues was based on their importance in life in the abbey or its history, but also on the progresses of scientific studies which, in the last years, allowed dating from the Carolingian period some older elements of S. Peter’s church, for instance. This big church is Jumièges Abbey’s most famous and better preserved venue. The reconstituted vision at the transept will represent, on one side, the nave with all its lost elements dating back to the Romanesque period (for example, the roof); on the other side, by rotating oneself, the visitor will see the chancel which was rebuilt in the Gothic period and was still there in the late 18th Century. The early 9th Century was chosen for the “Jumièges 3D” app; as a result, the document is exceptional, due to the rarity of Carolingian vestiges in Northern France. Several cloisters succeeded one another in Jumièges. The last known, shown in “Jumièges 3D”, dates back to the 16th Century and is characterized by a fine sculpted ornamentation which is typically found in the late Gothic style and the early Renaissance style. The gardens and the large dormitory room from the 18th Century. The last major building period in Jumièges Abbey is represented by the restitution of the last important building and some terraces, elevated by the Maurists in the 17th and 18th Centuries. The application is available at the reception desk of the abbey for 5€. The people owning a smartphone or a numerical pad (Android pad) can freely download the app.